Most of us that have been greyhound owners for years know how frustrating it can be to find a greyhound-savvy vet that will LISTEN to what you, as the owner, have to say about your dog’s problems and your observations. Recent threads on some of the forums encouraged me to share some insight into this subject. Here are some of the rules that I live by which have been compounded over many years of dealing with vets that say “Oh, I know greyhounds, I vetted them in college.” The truth of that statement is – they used greyhounds as the examples and test dogs for the students to practice their various skills. Because greyhounds are mostly docile and compliant, they make great dogs to use as “subjects”. 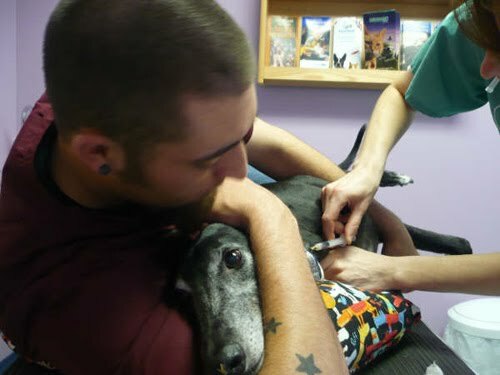 This does NOT mean that every vet that went to college KNOWS greyhounds and their health issues. When you search for a new greyhound-savvy vet, referrals from other greyhound owners or your adoption group representatives are your best resources. Everyone likes their vet for different reasons. Not every vet will match every owner’s expectations. As an example – One vet I know is a fantastic orthopedic vet and a remarkably caring person. He has better than average diagnostic skills but his specialty (and they all have their areas) is orthopedics. He will spend time digging to find out what the problem is and go the extra mile to diagnose an ailment. Another vet is a diagnostician extraordinaire but his bedside manner is a wee bit lacking. If you can understand that he is more concerned about your dog than your feelings, he may be the vet for you. Both of these vets are excellent greyhound vets and have many years of experience in vetting and doing surgery on the greyhounds. Our local personal vet has been vetting greyhounds for over twenty years and loves them as a breed and is very knowledgeable about their particular issues. However, she is very quick to refer you to a specialist if it is out of the ordinary realm of her knowledge. All of these people “listen” when you tell them what is wrong with your dog. They will ask you lots of questions about behavior, habits, normal daily routine and out of the ordinary things that your dog does. When you adopt your dog, you are given a set of paperwork in your adoption packet that provides details about particular medical idiosyncrasies specific to the greyhound. When I take a new dog to any vet, I always take along a set of this paperwork and hand it to the vet. After all these years, my vets give me a look but my response is this – “I am required to give this to you by the adoption group. As part of the contract I signed, I am to provide this to you to be certain that you understand everything that is different about the greyhound. This info is updated constantly with new and important info that you may find useful. Please read this, otherwise, I am in violation of my adoption contract.” You will be amazed at how many vets will then give the paperwork at least a once over. That is the start of your relationship with your vet. Make it very clear that you as the owner are planning on being an integral part of any care and treatment they plan to administer to your greyhound. If the vet you visit has a problem with this idea, then you need to find another vet who will understand your decision to be involved. Veterinarians are human; they are not gods. Sometimes, they need to be reminded that they are our employees when we visit them, not the other way around. If you start off on the right understanding with your vet, chances are your relationship will be a rewarding one for all concerned. It may take a few visits to different vets to find the right one for you and your pet. In the end, it will be well worth the effort for your greyhound. When your greyhound is having a problem and your vet will not/does not return your call or does not seem to want to talk to you about the issues, by all means seek another opinion or search for a new vet. Your dog’s health is the most important thing to you and it should be to whatever vet you choose as well.